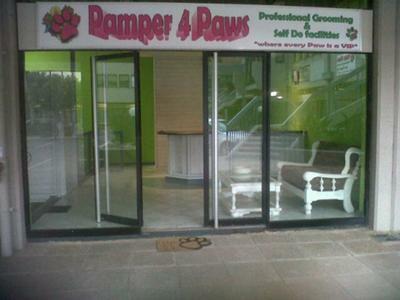 Pamper 4 Paws is a Professional Dog Grooming Salon with a difference. A place where every Paw is a VIP! NO walls, open viewing and owner participation welcomed. An exclusive grooming salon where your pet is treated with care and respect as he/she deserves. 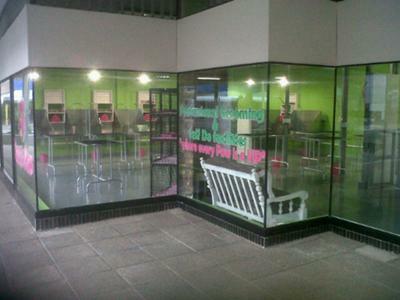 We also offer Self do facilities where you use all our equipment at a time that suites you. to book a Pamper for your Paw friend. I understand that the previous owners did not do a very good job of running the salon, but the new Owner, Linda van Vuuren, is an absolute angel with the animals, a very nice place to go. Many of my friends also go there now. My 3 dogs have never experience such luxury; the playpen is magnificant! No space-trapped cages. They play along with other "VIP PAWS", rest on the special low bed where no injuries when jumping off can happen (especially for my daschund), have fresh water and food all day long. I have learned so much from owner "Linda" and groomer "Caroline" that even now when I know to wash and dip my dogs the correct way, I'll rather go to "PAMPER 4 PAWS" to treat my "children" and myself! Thanks to Linda and her groomer team!! You are all STARS!! Awesome awesome awesome. Pamper 4 paws is like a spa for dogs. Playpen, treats and lots of attention. Will definately take my 4 dogs to Pamper 4 Paws on a regular basis. Thank you for the brilliant service. Buddy (my labrador) felt right at home. Maybe you should update the website, because they have moved to Lavender Road, next to the Cashba Roadhouse. Still the best place in town. They have excellent staff members treating your best friend with dignity and respect. Love the way one of the groomers sings to the dogs while grooming them...must be very relaxing to the dogs. Keep up the good work. Ek sal my hond na geen ander plek neem vir 'n was en skeer as Paper 4 Paws nie. Hulle is baie oulik en my hond het dit baie geniet. Took my 2 English Bulldogs here. Lizzie is a very nice person, but her groomers are not fantastic. They don't know how to work with the dogs. The groomer struggled to work with my dogs, and I had to help. She shaved them, but it was done so badly my poor babies looks terrible. Not happy at all and WILL NEVER go back there.